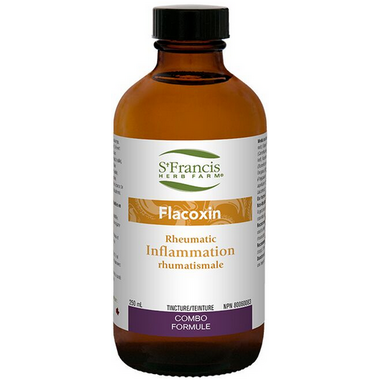 St. Francis Herb Farm Flacoxin is an all-natural inflammation fighter. Many chronic diseases result from unrestrained inflammation. Several of the herbs in this formula are potently anti-inflammatory, useful for treating inflammations such as arthritis, polymyalgia, fibromyalgia, bursitis, and tendonitis. Dosage: Adults: Take 2-3 ml (60–90 drops) 3 times daily in a little water on an empty stomach. For prolonged use, consult a health care practitioner.